It’s 9am, and it’s very early to be interviewing one of the most powerful figures within the University of Manchester Students’ Union (SU), and arguably, the University as a whole. Yet, here I am, face-to-face with Fatima Abid, the General Secretary (Gen Sec) of the SU. It’s far from the first time we’ve met, but this is the first time it’s a proper, sit-down grilling, of sorts. I sense Fatima is understandably more cautious with her words as she knows the tape is running. The reason I’m interviewing her is because Fatima is on tour. She’s already held a surgery in the Main Library, and on the 22nd November, she’ll be heading to North Campus, followed by an Ali G surgery on December 6th. Indeed, the North Campus surgery is part of an effort to re-engage North Campus in the rest of university life in Manchester, as Fatima sees it. Having established that these surgeries are not to be a passing fancy, I was keen to press the Gen Sec on her original manifesto which saw her win the Exec election despite being an “outsider” to the SU, as she puts it. One vital pledge was to improve podcast provision for students, with the service still being opt-in for lecturers. As Fatima explained, the University cannot force lecturers to put their material on the podcast website, as they have “academic freedom” in such a decision. “Right now, it’s about opening communications with lecturers who opt-out of podcasts and students who want in. I think the biggest problem would be in the humanities. Buses feature heavily in Fatima’s manifesto, which in itself is puzzling to me. Having come from a small city in which buses don’t usually run past 11pm, the cornucopia of services in Manchester was a revelation when I arrived as a fresh-faced-18-year-old. Oxford Road is supposedly the ‘busiest bus route in Europe’, and fares start at £1.50. What can be done to improve the services? Fatima recognises this, but also reminds me that “a lot of cities don’t have this many students, Manchester has easily 100,000 students living here”. She says she wants to improve “safety, reliability, and consistency” for students across Greater Manchester. 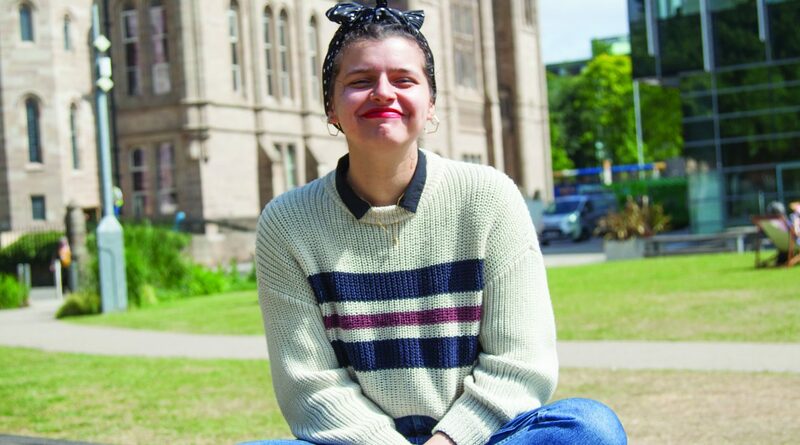 It’s at this point that Fatima gives us the first glimpse of her vision for student action in Manchester – a new elected body which can campaign on behalf of all the major universities in Greater Manchester with one voice. She wants to call it the Greater Manchester Student Assembly (GMSA). The GMSA would be tasked with lobbying the Greater Manchester Combined Authority (GMCA) on issues such as the aforementioned mental health, and transport. “The whole point of GMSA is I think students have unique issues. They are different from people who are residents in Manchester, they are different from people who decide to work here. “I’m hoping that because we’re such a powerful force in Manchester, that’s so underutilised, we can unite all of us – MMU, Salford, RNCM, Bolton [through GMSA]”. Although unwilling to sketch out the details for me, it was clear that Fatima was passionate about the project. However, it’s not as if students are short of opportunities to belong an elected body representing student interest. SU Senate has had a history of poor attendance, and Exec turnout remained below 20% in 2018. Why would it be any different for the GMSA? “I’m hoping people will be inspired by issues they’ve gone through, conditions they’ve lived in to inspire them to sit on the body. Fatima also recognises that the GMSA could fail, but she also seriously believes that something must be done about the lack of a unified voice for students in this city. “If students think [they can’t change things], then they should get involved and change it.